DINE Philippines 2015 Goes to the Latin City of Asia, Zamboanga City! 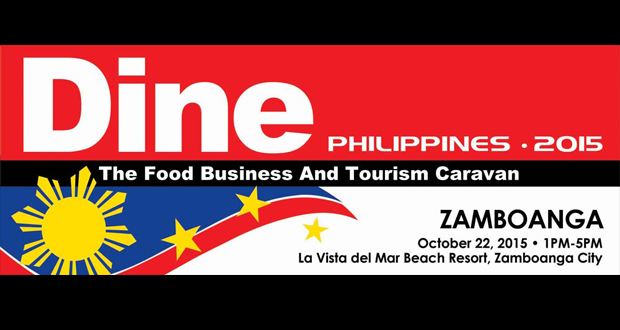 The DINE Philippines brings four (4) top-notch speakers to Zamboanga in the field of Food Business and Tourism, who will be sharing with you the latest trends, best practices and trade secrets of the industry. Chef Robby Goco, Executive Chef and owner of Cyma and Green Pastures will tackle “Best Practices of Farm to Table Restaurants”. Chef Jam Melchor, the Executive Chef of Healthy Eats Manila and Convenor of Philippine Culinary Heritage Movement, will be talking about “Rediscovering Filipino Cuisine, From Local and Global Perspective”. 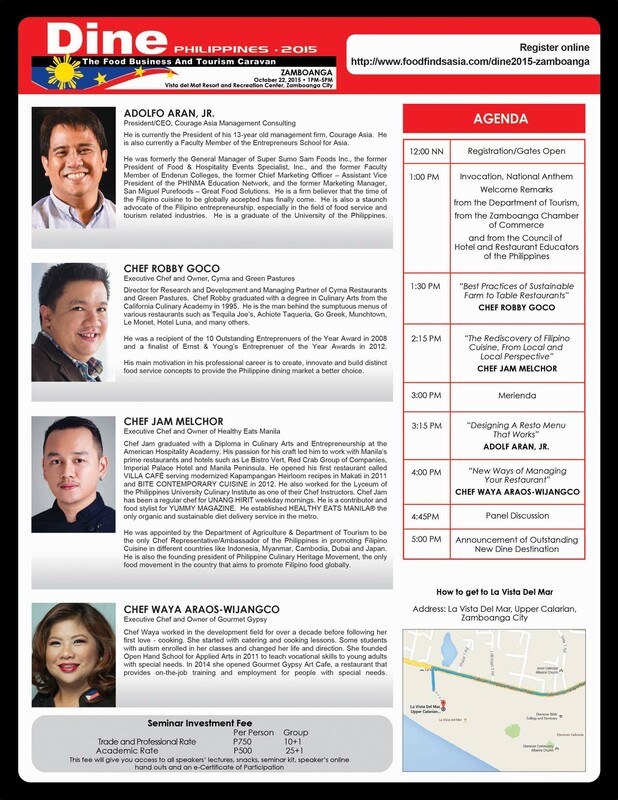 Mr Adolf Aran Jr., President and CEO of Courage Asia will talk about “Designing a Resto Menu that Works”. Finally, Chef Waya Araos-Wijangco, the Executive Chef and Owner of Gourmet Gypsy, will be sharing “Managing Your Restaurant Business: New Best Practices”. Zamboanga: Ms. Rosa Ramirez (Vista del Mar Resort and Recreation Center), 0917-8002214. This event is endorsed by the Commission on Higher Education and the Department of Tourism; and is co-presented by Del Monte and NutriAsia. Dine Philippines – Zamboanga is powered by Courage Asia.